Henry casually walked over and SAT IN KIP'S TERRITORY. The nerve of him - you can see how irritated Kip is at this. Henry is giving me the innocent "what, I just happened to stroll over here" look while Kip is giving me the "make him move" look. And now Kip was yelling at Henry, who was pretending that "lala lala I can't hear you" - oh, he knows how to push Kip's buttons. Well, obviously Henry was not backing down at this point, so Kip had no choice to settle in and wait him out. These cats! If they were human, I'd send them to couple's counseling...there's no reason why they shouldn't get along. But since I can't do that, I'll just continue to observe, mock, and laugh at them. Jackie was the best babysitter - she took her job seriously when it came to our kids. 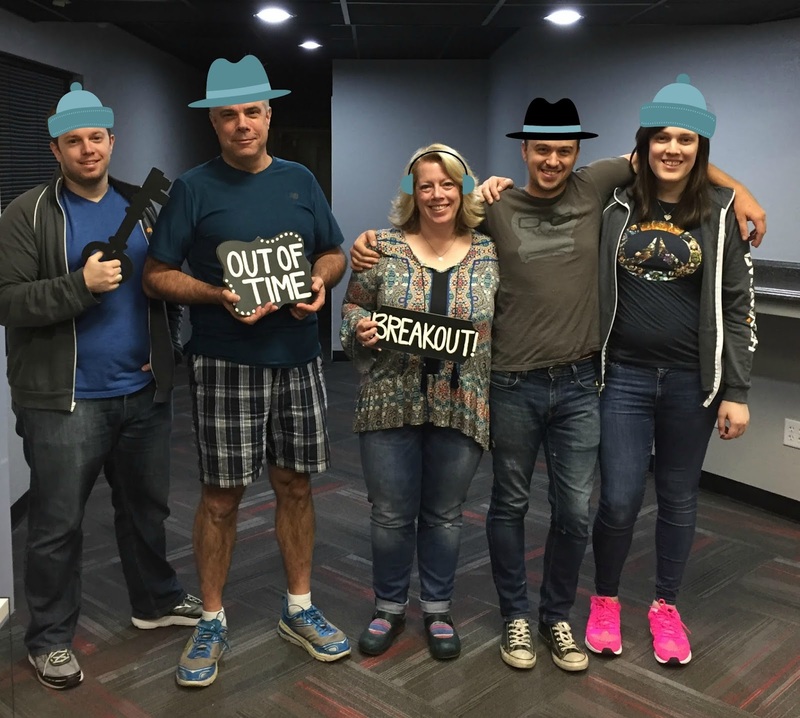 Last week, when all of the kadults were home, we had an adventure at the Escape Room BCS, which is a place where you get locked in a themed room and have one hour to figure out how to escape. We had a blast - only Sam had done one previously, and that was with coworkers as a team building exercise. We booked the entire room, because we didn't want the possibility of having random strangers included in our experience - this was just for us. We chose the Breakout theme, where one of us was locked in a jail cell (Kevin volunteered) while the rest of us ransacked the sheriff's office for clues to get him out, and then we still had to escape from the office itself. Fun with PicMonkey...winter headgear for all! 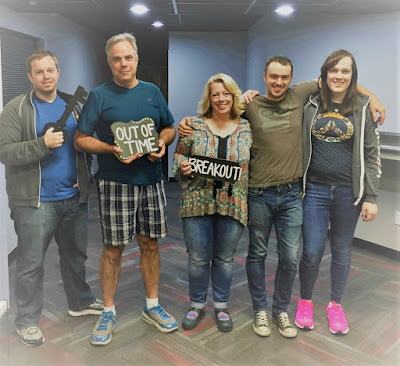 It was challenging and Jeff and I were impressed at how quick the kadults were at figuring out the clues compared to us, but there were a lot of clues and we all ended up contributing. 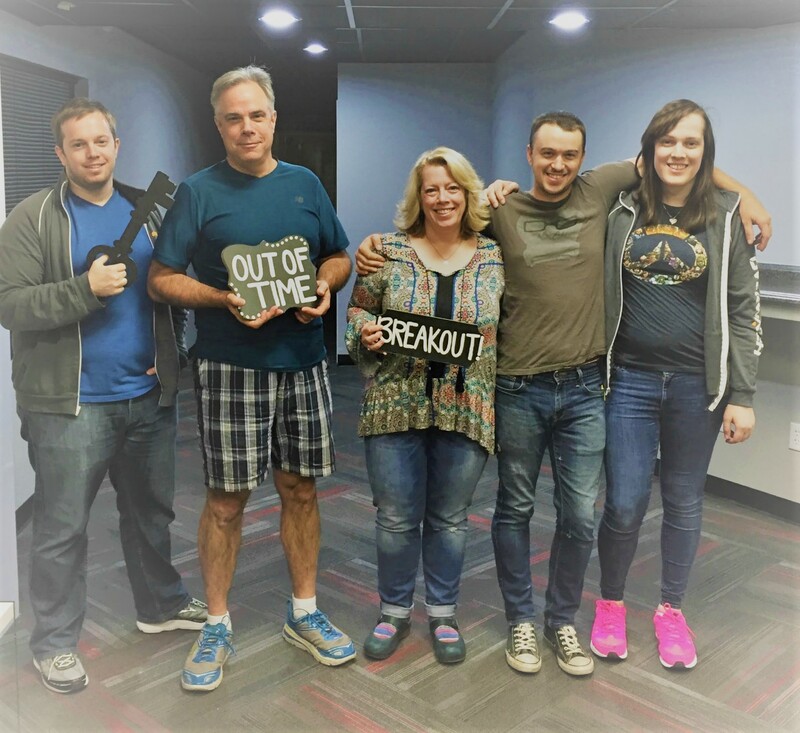 We could make a phone call for clues if we got stuck; when we were running out of time, we finally made one call (you have up to five) and made it out, but not before our hour time expired - it took us about 62 minutes to escape. I don't want to say too much about the room itself so I don't give away the clues, in case any of you end up doing one of these, but it was great fun and we're planning on doing it again next time the entire family is together. I've heard about this game! It sounds so fun. Seems like you made really good time compared to other I've heard! God job! I'm just glad we made it out! It was really fun. And people say cats have no personality. Those breakout rooms are all the rage suddenly. I've seen them on TV shows, and noticed some local friends posting about one around here on FB last week. Sounds like a great family activity. The escape room was super fun but I suspect if we didn't have younger people in with us, we'd have had to ask for more clues...they were pretty quick at figuring things out. That breakout room is so cool! I haven't heard of them before. Cats crack me up. I think they really are the rulers of the planet. They are just using the internet to slowly take it over. Hah, you are probably correct regarding the great cat takeover! Love the whole cat dialog! And Jackie--the cutest dog ever! I love it that you really enjoy spending time with your adult kids, and that they enjoy spending time with you! Jackie was so cute. I miss her still! It is nice that our kids still like us, and we them. I know that's not always the case so I'm especially appreciative of it. "I would take them to couples counseling"....oh that made me LOL! I've been wanting to try one of those escape rooms but ours are pretty pricey around here. LOLOLOL at the cat dialogue. So funny!!!! Allie & Jackie!! So cute. 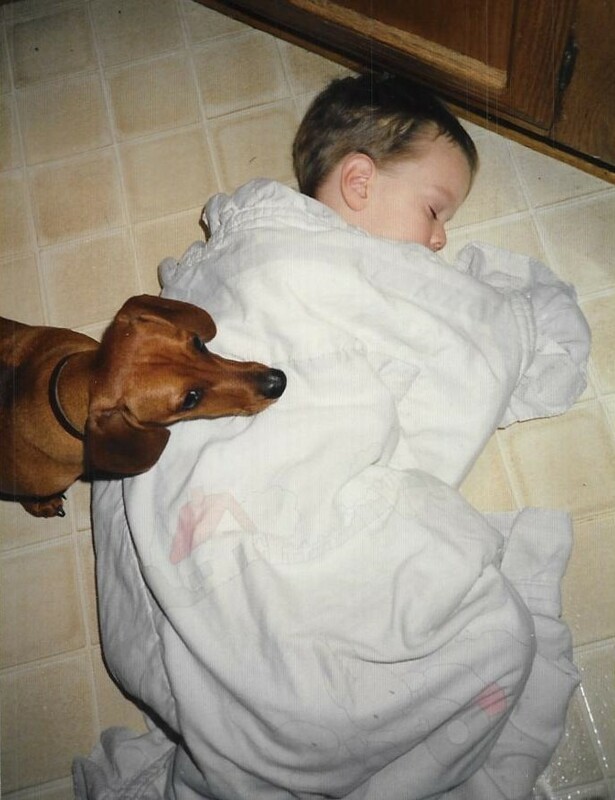 Beautiful baby, cute doggie. Ohhhh the cats, they definitely need therapy but on the other hand, their reaction to each puts a big smile on my face. The photo of Jackie and Allie is so cute. There is kind of similar photo of me as a little girl with our dachshund Wallie. And the escape room sounds like a lot of fun. There is one 5 minutes from my house we have never done it.